As you’ve seen, I’m seeking good books. I’m reading each title for hobby content. Are there autograph insights? How are fans treated? What anecdotes would mean the most to a collector? Most of all, is the book honest? Is it a fun title to read? Publishers and publicists: If you have a current baseball title, let me know. 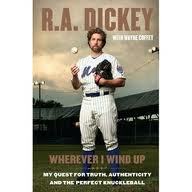 I am interested in that Dickey book, looking forward to your review. He talks about autographs in his book. He said that he would start to sign some of his mail a little differently to see if they would show up on ebay.